Bob's Blog: Coming on January 20: a full, blood, wolf moon! Coming on January 20: a full, blood, wolf moon! 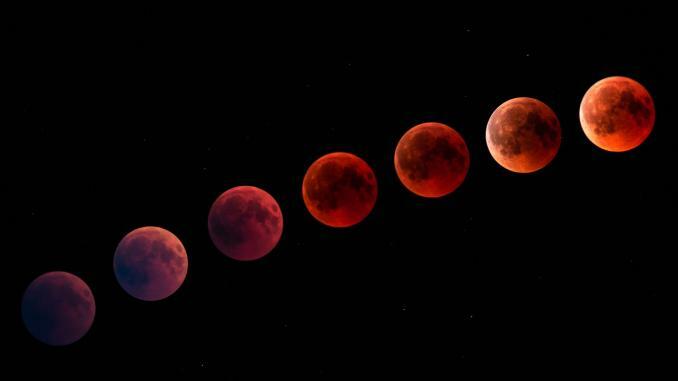 "Blood" moon. That is just the reddish color the moon will appear during the total lunar eclipse. The moon won't turn black or vanish from the sky; instead it will appear to be a "reddish copper color," Murphy said, hence the name blood moon. "Wolf" moon. According to the Old Farmer's Almanac, Native Americans called the January full moon the "wolf" moon because it appeared when wolves howled in hunger outside the villages. For millennia, people across the world, including Native Americans, named the months after nature’s cues. Though the moon will be full precisely at 12:16 a.m. EST on Monday, Jan. 21, according to space.com, it'll still be plenty big through the rest of the night and for the next night or two. Just as it has for billions of years, the full moon will be visible to everyone around the world, barring pesky clouds. Speaking of clouds, here's the big question: Will they ruin the view? Unfortunately, since the big event is more than two weeks away, accurate weather forecasts are not possible yet. If you miss this month's total lunar eclipse, you have to wait until May 26, 2021, for the next one in the USA. The next partial lunar eclipse will be this summer, on July 16, but will be visible only in Africa and portions of Asia.